On our second night in Marrakech we had dinner booked at The Selman hotel, which is a 5 star hotel situated about 15minutes outside the centre. Prior to dinner we decided to visit the La Mamounia hotel for cocktails, as we’d been recommended by friends that it was a must whilst in Marrakech, and we sat in the pretty gardens and enjoyed a refreshing early evening cocktail each. Arriving at The Selman, you definitely felt like you were entering somewhere plush, and the drive to the hotel was prettily lit up with a huge backlit fountain in the courtyard opposite the entrance. We were warmly greeted and walked through the hotel’s lobby and dining room, which was filled with ornate architecture, chandeliers, soft lighting and decadent furniture. We were seated at a table for two which was directly opposite the french doors leading out onto the hotel’s terrace overlooking the swimming pool and gardens. It was a gorgeous table with a picturesque view and we were swiftly introduced to the restaurant manager, who was immediately friendly and helpful making us feel like we were in good hands. After ordering a bottle of Moroccan Viognier, we were brought some homemade bread and butter whilst we chose what to order. 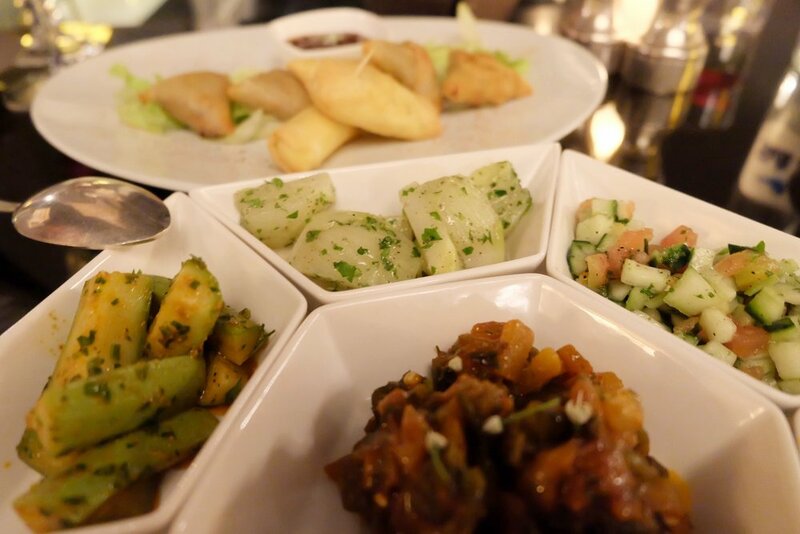 We decided it would be nice to try some Moroccan Salads again, so ordered those to share to start, along with some Moroccan Pastries, called Briouates. The salads arrived in lots of little bowls, just like at La Sultana, and the Pastries were a mixture of Chicken, Beef and Vegetable and looked a little like small samosas. The highlight of the salads had to be the carrot with sultanas and rose water, which was a completely different way of eating carrots and it was fragrant and very moreish. The Fennel and Cauliflower Salads, which were perfectly cooked and seasoned, were also a favourite. Each of the pastry fillings were tasty and they were encased in a crisp filo pastry which was not greasy at all. The two dishes worked well together as starters to share. For main course I chose the Chicken Tagine with Confit Lemon, Saffron and Olives, and my husband Steve, ordered the grilled Fillet of Beef with Finger Couscous and Celery and Vanilla Puree. The tagine was full of flavour and the chicken was perfectly cooked and melted in the mouth. I probably didn’t need it, as it was filling on it’s own, but my only complaint was that it would have been nice to have been accompanied by some couscous. Steve’s steak was cooked to perfection and the finger couscous was something new to us; served exactly as it said in fingers with a soft and fluffy centre and a crispy coating. The celery and vanilla puree was bursting with flavour however we felt it was a little out of place as part of the dish. For our dessert, we retired outside to the terrace and were shown to a comfy sofa looking out at the swimming pool, twinkling away with the evening lights. We ordered some ice cream and sorbet and mint tea to share and sat enjoying the last of our wine looking out at the night sky. The Orange Sorbet was refreshing but tasted a little artificial and the Pistachio Ice Cream was creamy and full of nutty flavour. The Macaron, Marshmellow and Jelly which accompanied them were very welcome treats! Each outdoor seating area has a complimentary shisha pipe to use in the evenings and Steve enjoyed full use of his whilst we drank wine and listened to the chilled disco music playing. The terrace had a really nice atmosphere, with other guests eating or drinking around us, and it was a great end to a lovely evening at The Selman. Dotty Dishes was a guest of The Selman. The Selman, Km5 Route d'Amizmiz, Marrakech, 40160, Morocco.